Meat on sticks. It remains one of the most popular street foods, which is why there is a whole chapter of the stuff in Snackistan. And the business of cooking over fire makes for some great images. For this month’s photographic offering, we chose this dude, who is obviously proud of his handiwork…even if giving Edward Scissorhands a run for his money. Mr. Kebab Hands is actually a street vendor in Uzbekistan, as captured by xoque and borrowed with thanks under the Creative Commons Licence on Flickr. This entry was posted in Postcards from Snackistan and tagged kebab of the month, meat on sticks, Mr. 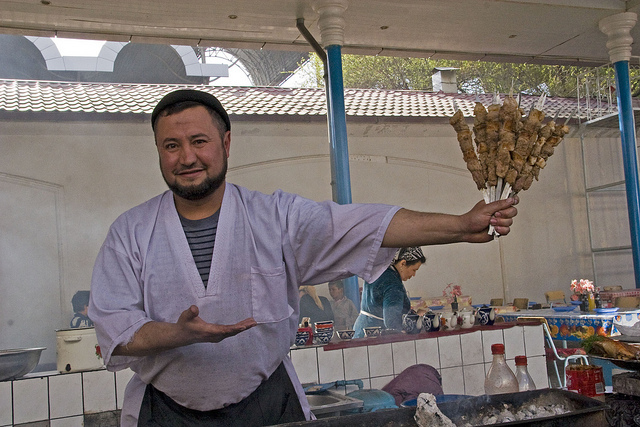 Kebab Hands, Uzbekistan on January 14, 2014 by Sally Butcher. Meat-on-Sticks Photo of the Month: Chopan Kabob, Afghanistan. With added recipe.